The studio of Philippe LeBlond. Before beginning my Feldenkrais Training Program in Santa Fe, I visited Montréal. Wanting to stay in the Feldenkrais flow, I contacted practitioners about group classes in English. None were available, so I scheduled a private session with Philippe Leblond, who had trained with Moshe Feldenkrais. In such a lesson, known as Functional Integration, the practitioner adjusts the student’s body to help the nervous system recognize and assimilate more effortless and functional ways of moving (here’s a video of such a session). He advised me that his space was in a transitional neighborhood, next to some vacant storefronts on a block I might otherwise ignore. Pulling up in my rental car, I saw FELDENKRAIS painted in red, along with an outline of a jointed figure, on a plate glass window. He greeted me with a wide smile and sparkling eyes. His cushioned table, on which lessons are conducted, lay in the middle of a mesmerizingly deep blue room. From the inside, I noticed there were no shades or curtains. Anyone on the sidewalk would be able to peer inside, a thought that gave me pause. I’d had a few Functional Integration lessons in Boulder, CO, in a quiet office. The privacy and near silence helped me focus on sensations and subtle differences as the practitioner showed my body new ways of moving. Monsieur Leblond invited me to a sit on a wooden chair. He sat on a bench, limber and fluid as he relaxed against a blue wall. We started to chat about how we had each discovered Feldenkrais, still not a household name. I described how my leg injury had, eventually, led me to it. “Are you comfortable?” he asked, diverting the conversation. Although I had spent hours lying on blankets, becoming aware of how I contacted the floor, it hadn’t occurred to me to check in with myself about how I was sitting. To my chagrin, I couldn’t tell. I shifted my buttocks and legs slightly to see if that would bring more information. “I’m not uncomfortable,” I said. Which wasn’t equivalent to being comfortable. He laughed. Still, I wondered what had overriden my awareness of whether my contact with the chair was comfortable. Was it the novelty of being in another city, a different country and with a person who, while extremely sympathique, I had just met that made it harder for me to tune into my body? Bones abound at the studio of Philippe Leblond. “Engineering is fine with me,” I said. The underlying contributor to my tendonitis was largely mechanical, I believed, and it didn’t need ornamented language, incense, or incantations. 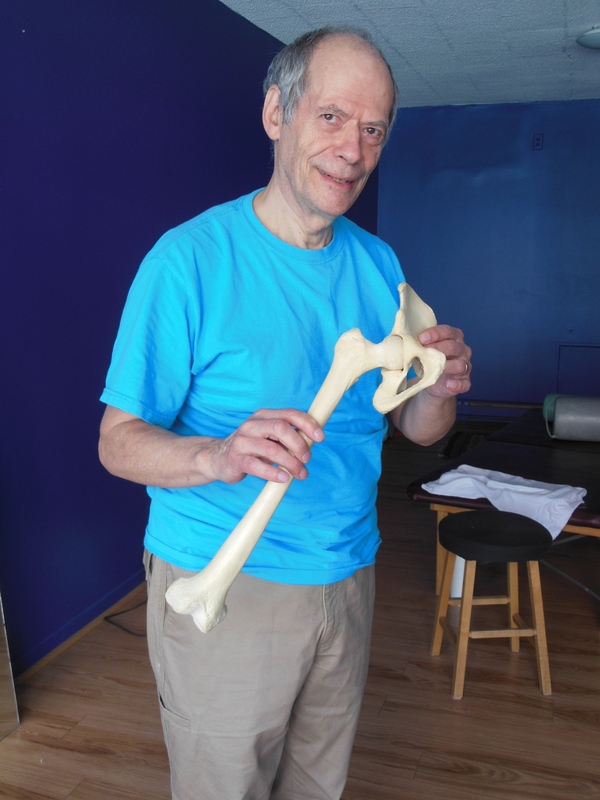 One reason I was drawn to Feldenkrais is that its results can be surprising if not extraordinary, but the approach is grounded in scientific principles and the use of attention and awareness. He turned, stood, and lifted a human spine from a hook on the wall, and dangled it in front of me. That’s been the trait of every Feldenkrais practitioner I’ve met so far: an ability to meet a person where they are, without judgment or expectation that they “should” be anything else. That quality of acceptance impresses me more than their technical skills. He returned the spine to the hook and invited me to remove my shoes and lay down on the table. Even though I had mentioned my leg, he started the lesson at my upper torso. Being practiced at his profession, he moved quickly and energetically as he touched and sensed. The Functional Integration lessons I had in Boulder had a more subtle quality, so I imagined all sessions were like that. “What are you doing?” I asked, laughing from surprise as he pulled my right arm across my body. “Just seeing how things are organized,” he said. Having now attempted miniature Functional Integration sessions in my training, I’ve seen and sensed how force is transmitted through the skeleton. When a person is horizontal, moving the pelvis also shifts the head, and vice versa. When that trajectory is blocked, through stress or other chronic holding patterns, the practitioner investigates why and tries to help the body reorganize. He moved onto my legs and, by positioning them a certain way, applying force and asking me to push against him, activated underused muscles. Now that they had been called upon, they’d start to remember to pitch in when I walked, helping redistribute the effort. “Are you comfortable or uncomfortable?” he asked. “Not uncomfortable,” I quipped. We laughed. He asked me that same question a few more times at random moments, probably to see if I’d vary my response. To keep the gag going, I did not. Then he put a bit more pressure on my ribs. “Uncomfortable,” I said. I think he was relieved that I finally made a distinction between comfort and discomfort. Often, I don’t know I’m uncomfortable until something starts to hurt. Even then, the compulsion to finish whatever I am doing might intensify that initial sensation. For years I mistrusted comfort; I worried too much of it would make me “soft”, rather than the tough cookie I aspired to be. But without sufficient comfort the nervous system can’t relax, impairing growth and learning. He left me to rest and I heard him pad to the back of his studio, turn on the faucet, and wash his hands for what seemed like a long time. Since he wasn’t performing surgery or dental work, I wondered why he was being so thorough. I considered asking, but decided not to since I was quite relaxed and didn’t feel like talking. Plus, I trusted our rapport and it seemed we were on an adventure. When he returned, he sat behind my head and, without saying a word opened my mouth, took hold of my teeth and used them to move my jaw. That he didn’t ask me was probably wise, since that might have invited resistance or a polite refusal, and I wouldn’t have had a super deluxe Functional Integration. Whatever he did loosened up the rest of me even more. By the time he helped me to a sitting position and scooped me off the table with a huge hug (which he did announce), I felt as if I had just been on vacation. “Look at yourself,” he said. Since my body was so relaxed, and my legs in feet in slightly different positions than when I arrived, I teetered to a full length mirror and peered at the results. My hair was askew but my skin glowed. All signs of worry had been erased. “See how beautiful you are now?” He had a point, although being vain I wanted to quibble with the word “now”. As I put my shoes on, he told me that if I were to come back to see him again he’d work more on my jaw. If Montreal were closer, I’d be there in a heartbeat.